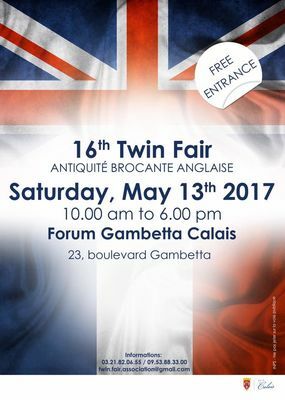 CALAIS will be on English time when hosting the 16th TWIN-FAIR Saturday May 13th ...... from 10am to 6pm ...... at the Gambetta forum. Marie-Christine Livermore President of the French-British association TWIN-FAIR, her team and with the support of the city of Calais, are organizing this cultural event that is lovers of rare objects shouldn't miss!! This events strengthen the friendship between France and Britain very present on the coast. You will be welcomed by many antique dealers from over the Chanel. There is no review about 16Eme Twin-Fair, be the first to leave one !